What if the ‘Dancing Girl’ was actually a warrior? India And The World: A History In Nine Stories, a three-month-long exhibition that opened last week in Mumbai, has a lot of numbers in its favour, including several firsts. It is an ambitious collaboration between three museums—Mumbai’s Chhatrapati Shivaji Maharaj Vastu Sangrahalaya (CSMVS), Delhi’s National Museum and the British Museum in London—and it brings together two million years of history through 228 artefacts. Meant to be a celebration of 70 years of Indian independence, it is a culmination of three years of planning. At a walk-through earlier this week, Indian art historian Naman Ahuja, who has co-curated the exhibition with the British Museum’s J.D. Hill, took us through “a tunnel of darkness" into the exhibition’s first section or story, titled “Shared Beginnings". The highlight here is a quartzite hand-axe excavated from Attirampakkam in Tamil Nadu, displayed alongside the far more famous quartz hand-axe found in the Olduvai Gorge in Tanzania. 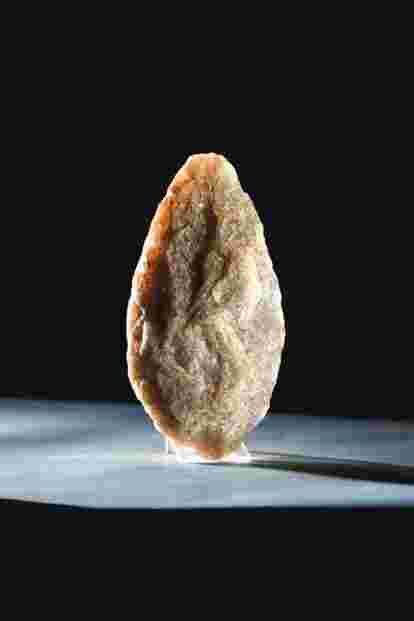 While the Olduvai hand-axe is believed to be 800,000-400,000 years old, the one from Attirampakkam, excavated in 1999, goes back 1.7 million years, he says. There is a collective gasp among the members of the group, which is exactly the sort of thing that Ahuja is worried about, he tells me during an interview the next day. He is wary of a self-congratulatory takeaway from the show. He is wary of patriotism. Of jingoism. And of the “we were always better than them" narrative. Ahuja’s doubts are all the more relevant in a week when a Bollywood movie’s release is under threat because a certain group of people believe it distorts history. “Museums all over the world contain fantastic bits of evidence of time passed just as a law court contains evidence. It’s important to bring (the evidence) out because a lot of times presumptions are made about societies without having looked at the evidence," says Ahuja, adding, “I would think that many received notions on the progress of history have been brought into question by this exhibition." India And The World, as the title suggests, is not an exhibition merely about India but about India and its links to the world. The contemporaneous tone is not to show up or show down other cultures, but to put the history of mankind under rigorous scientific and aesthetic scrutiny. Ahuja is keen to explain that it is not just an exhibition to look at India’s contribution to the world but also at what it has received, by giving concrete touch points from stone tools to clay pots and fine porcelain painted in cobalt. “The objective is not to get caught up in the narrow cultural politics that have started defining us…it is meant to inspire respect for difference rather than expand our hegemony on other people," says Ahuja. In 2010, former British Museum director Neil MacGregor wrote the much loved A History Of The World In 100 Objects, using iconic artefacts to tell the story of human history, which was no doubt a seed idea for this show, jointly conceived as it is by MacGregor and CSMVS director Sabyasachi Mukherjee. But it is not as simple to translate this seemingly foolproof format to an Indian context. In the exhibition’s central hall, Shiva’s mount Nandi, the bull, marks the way, as he does to every Shiva temple. It is an impressive granite sculpture and the card placed below dates it to 800-900 AD. I see a museum guard praying to the bull. He seems aware that it might not be fully appropriate to do so: His eyes open and shut and his clasped palms are at waist level. Ahuja was with me when I saw this. “People are going to respond to objects as an object of faith... you can’t deny them that," he says. How does one convince museum visitors in India, a land of mythic time and oral histories, to pay attention to objects as historical evidence? The rational answer is that it is difficult, but “as someone interested in art, mythology and poetry", Ahuja believes the question itself could be a driving force for museums in India to function better. For now, the immediate takeaways from the exhibition, and certainly more easy to grasp, are the flashes of insight and new perspectives that specific objects in the exhibition provide. Like in the section “First Cities", where the curators decided to look at the lives of the women in these ancient cities. 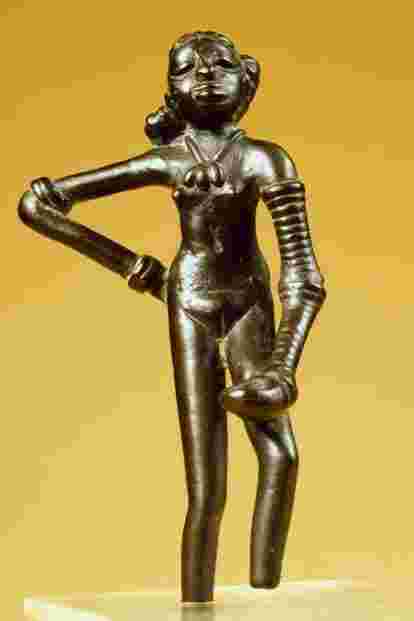 We have always known the Dancing Girl excavated at Mohenjo Daro as a dancing girl, without question. But what Ahuja posits is that perhaps this was coloured by the gender bias of the archaeologists who discovered her in the 1920s. “Women were regarded either as objects for titillation or venerated as the mother goddess. And in between the two, there was no other role for them as equals or any other way," he says. The figure has bangles all the way up her left arm but her right arm is bare, as any working person would have it. A decorated left arm and a bare right arm free for labour…or for war? “If she was a dancing girl by profession, surely it would have been relevant to keep both arms decorated? Look at the way she is standing. Look at her confidence. One arm on hip. Head thrown back. The way her hand is sculpted, there might have been a spear in her hand. Is she a warrior figure? Could she be a soldier rather than a dancing girl? Another startling insight for me was in the section titled “Quest For Freedom"—the bound Constitution of India has more than 50 paintings supervised by the renowned Bengal School artist Nandalal Bose; it is an aesthetic document as much as it is a legal one. This sense of aesthetics took me back to the mention of the Olduvai hand-axe. Made of quartz, a difficult material to make tools with, it was chipped away to create a symmetrical teardrop shape which added little to its functionality. This suggests that the beautiful pale pink hand-axe may have had other purposes: It may have been a status symbol or been used in rituals. The hand-axe may represent the earliest instance of artistic pursuit. So while new interpretations of the Dancing Girl are welcome, and many more might be forthcoming, there is one claim that this exhibition makes irrefutable: Human beings have always lived in pursuit of beauty. And exhibitions such as this one are timely reminders of that in an age of inelegance. India And The World: A History In Nine Stories is on display at CSMVS till 18 February. It will travel to the National Museum in Delhi after that.